The Global Volcanism Program has no activity reports for Bayuda Volcanic Field. The Global Volcanism Program has no Weekly Reports available for Bayuda Volcanic Field. The Global Volcanism Program has no Bulletin Reports available for Bayuda Volcanic Field. The Bayuda volcanic field is located in the Bayuda Desert of NE Sudan, south of the major Abu Hamed bend of the Nile River about 300 km north of capital city of Khartoum. More than 90 eruptive centers along a WNW-ESE line were constructed over Precambrian and Paleozoic granitic rocks near the center of the Bayuda Desert. Most vents are cinder cones that produced lava flows which breached the cones. About 10% of vents in the field are explosion craters, the largest of which, named Hosh ed Dalam, is 1.3 km wide and up to 500 m deep. The youngest basalts appear to post-date the last period of moist climate in Sudan, which ended as recently as about 5000 years ago. One of the least eroded lava flows was dated at about 1100 years ago. Almond D C, 1974. The composition of basaltic lavas from Bayuda, Sudan and their place in the Cainozoic volcanic history of north-east Africa. Bull Volcanol, 38: 345-360. Almond D C, Ahmed F, Khalil B E, 1969. An excursion to the Bayuda volcanic field of northern Sudan. Bull Volcanol, 33: 549-565. Almond D C, Kheir O M, Poole S, 1984. Alkaline basalt volcanism in northeastern Sudan: a comparison of the Bayuda and Gedaref areas. J African Earth Sci, 2: 233-245. There is no Deformation History data available for Bayuda Volcanic Field. There is no Emissions History data available for Bayuda Volcanic Field. 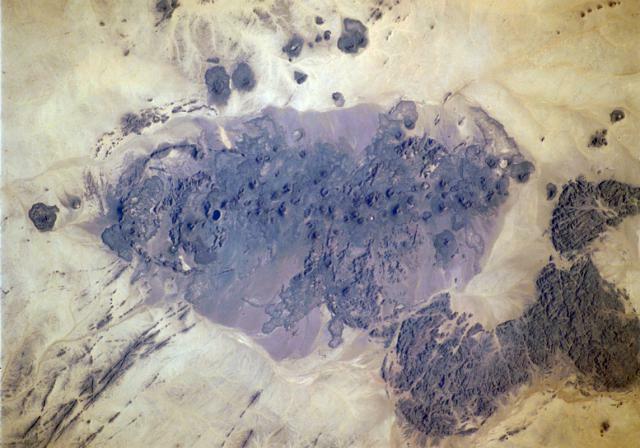 The Bayuda volcanic field is located near the center of the Bayuda desert of NE Sudan. The numerous small cinder cones that trend horizontally across the center of the volcanic field in this Space Shuttle image were erupted along a WNW-trending line. Lava flows, one of which was erupted about 1100 years ago, are visible in this image, but about 10% of the vents are explosion craters. Bayuda was constructed over Precambrian and Paleozoic granitic rocks, which form the darker areas at the lower right. NASA Space Shuttle image ISS004-711-20, 2002 (http://eol.jsc.nasa.gov/). There are no samples for Bayuda Volcanic Field in the Smithsonian's NMNH Department of Mineral Sciences Rock and Ore collection. Large Eruptions of Bayuda Volcanic Field Information about large Quaternary eruptions (VEI >= 4) is cataloged in the Large Magnitude Explosive Volcanic Eruptions (LaMEVE) database of the Volcano Global Risk Identification and Analysis Project (VOGRIPA).